I have a weird thing about bananas. I really only like to eat them when they are green. Once there is no more green, or even a bit of brown it’s usually way too sweet for me. No need to worry, bananas never go to waste in our house! Usually if I don’t add them to my oatmeal or bake with them, they get tossed in the freezer for another day or a quick smoothie. Right now our banana supply is overflowing in the freezer. The cooler weather just turns me away from smoothies, and I crave warm comforting foods. Banana bread with a cup of tea being one of them. Pre-heat your oven to 350 degrees. Coat a 9×5 loaf pan with olive oil spray. In a large mixing bowl beat the butter and brown sugar together for 2 minutes. Add the apple sauce, maple syrup, eggs, banana and vanilla extract and mix. In a different bowl combine the remaining dry ingredients, except the pecans. Add the dry to the wet ingredients and mix until combined. Stir in the pecans and pour into the prepared pan. Bake for 50-55 minutes. Check doneness by inserting a toothpick into the bread. If it comes out clean remove from the oven. If it starts to darken to quickly cover in foil while baking. You sound like my husband – he only likes bananas when they are green too, which means we’re forever having extra bananas lying around since they change so quickly! 🙂 The bread looks great, btw! Mmmm, that looks fabulous! Thanks for commenting on my blog. I can’t decide whether or not to run a full marathon. I think I’m going to do a post on that soon though! Unfortunately the Les Mills DVDs are not for sale. They are for the instructors to learn off of only. i actually don’t LOVE bananas, but in bread? yes please! I am always on the lookout for better for you banana bread, thanks for sharing! ohh this looks delicious and healthy 🙂 always on the look out for new banana bread recipes!! 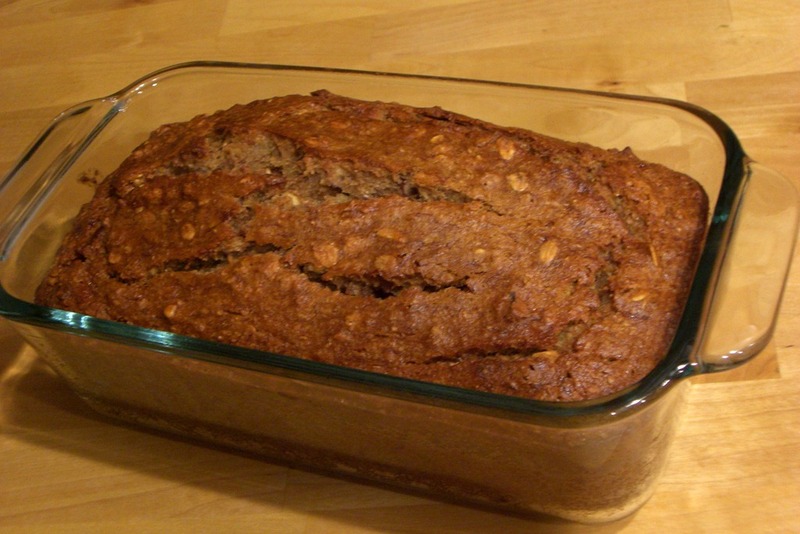 Your banana bread looks delicious and even better that it’s so healthy. This looks delish! I agree that baking bread is such a perfect thing for fall weather…and, of course, eating it! !